Accreditation Ambassadors is a series of stories that will show how individuals and their departments are helping IU Southeast cultivate and maintain a culture of constant improvement. Melissa Hill has worked at IU Southeast for 14 years. In that time she has taken on a variety of roles and challenges, always delivering more than was asked or even imagined, driven both by a desire to prove herself and by her relentless curiosity. 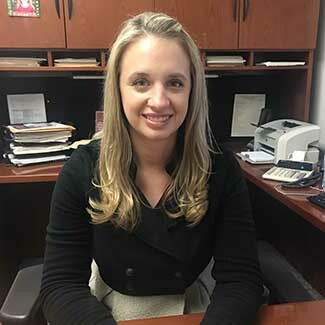 As director of academic accounting services, Hill works alongside lifelong friend Ashley McKay, director of student accounting services, and leads a dedicated team of professionals who combine a deep institutional knowledge and a robust customer service ethic. Since 2016 she has excelled in a new role as instructor of accounting and finance, earning the respect of colleagues who were her professors not so very long ago. Melissa Hill spoke with Academic Information Officer Steven Krolak. How does the work of Accounting Services reflect the mission of IU Southeast? First, we support and provide consultation to our campus by offering guidance and expertise on how to enhance programs and support services through the proper, coordinated and efficient use of the university’s resources. But we do more than just day-to-day finances; we are also checking for liability and legal concerns, we examine contracts and send them to the appropriate officers at IU to be reviewed, and we create long-term analyses of university programs to make sure they are going to be sustainable over time. Second, many of our staff members serve on committees that support our students and academic programs, including the Academic Council, committees for enrollment management and scholarships, and regional financial committees in areas such as parking. In fact we’re constantly speaking to other IU campuses. We advocate for IU Southeast. When policies and procedures that affect the regional campuses are being created, we make sure our voice is heard, and that IU Southeast’s needs are taken into consideration. Third, in our bursar function we provide high-quality, personalized service to our students by helping them meet their individual financial commitments, including offering payment plans, employer sponsorships and deferment options. Typically we meet with the students individually to see what their situation is, and develop a plan that works for their particular situation. Sometimes they determine how much they can pay each month. We work with financial aid to determine if there is any aid available that students may not have known about that would help them with their bursar account. How does the work of your team demonstrate a culture of constant improvement? We are continuously working with our campus and other IU campuses to streamline processes, introduce new technologies and create efficiencies with our services. Updates are constant in our field, so we have to be willing to embrace change—or even lead it. Within the IU system we are known as innovators, and are often sought out for best practices and opinions on procedural changes. When the campus card program resided in our office, we introduced an off-campus vendor program, meal plans, vending machines that accept payments and various online services. We have also created new positions, including budget analysts, who are financial experts that take the strategic accounting burden off individual schools. In our accounting role, we provide communication and training to the campus community on financial systems and changes. In our bursar role, we are always looking for ways to simplify processes and improve the student experience. Often we volunteer to test new systems and processes to provide feedback and play an important role in how the systems are implemented across IU. Those actions really deepen our involvement in the life of the campus, which is also an improvement, because it makes us more responsive and sensitive to the needs of the campus community. For example, I developed the UCard program, and we were the first IU regional campus to add a financial component to the ID card system. It was a big success for the department, but what I enjoyed most was that it got me a little bit outside of accounting by incorporating marketing and campus involvement. I needed to talk to the students to see what kinds of services they wanted. I had to go out into the community to meet business owners and develop relationships with them, and set up contracts so that students could use the UCard off-campus. What does accreditation mean to you personally? It means a great deal. My heart belongs to IU Southeast because it has played such an important role in my life. My mother went to school here—I remember watching her graduate on my thirteenth birthday. She taught me how to drive in the IU Southeast parking lot. I received my bachelors in accounting and my MBA here. I always had the goal of working here someday. As an alumna of IU Southeast, I believe that accreditation brings value and purpose to my degrees, with the confidence in knowing that my education is respected in the community. As an employee of IU Southeast, I am proud to work for an institution that provides quality education to individuals, and that prepares them for a successful future as valued members of society. I love being around academia. I feel that being around so many new experiences and new ideas has made me a better person and a better parent. The more you know, and the more you walk in someone else’s shoes, the more you understand everyone else’s situation.